Last weeks challenge for DailyPaintWorks was to paint something copper. My challenge last week was to survive a predicted one to three inch snowfall that turned to twelve inches. Today we are suppose to get another eighteen inches by Tuesday night. Painted in oil on a 8x10 inch canvas. Sides are 1/2 inch, painted brown/grey. Hey, Caitlin here. I’m back for ‘sidetrack saturday’ and today I’d like to discuss old family photographs. I consider myself lucky that my family has so many old photos to look through. While albums of me and my siblings are fun and nostalgic, what I find really intriguing are the older family photos. Old photographs of people I never got to meet, who were living their lives in decades that are now long gone, are inspirational to me. If you let yourself be creative enough, you can start writing stories in your mind about the people, and completely transport yourself back to the time that photo was taken. What was on her mind? What was his personality like? Why are they all wearing those hats?! This is one of my favorite games and it’s essentially cheap time travel. Last week, my mom and I were going through old photographs and I was enjoying my old photo game. Many of them caught my eye, and I loved plotting out little stories about the people in the photos and what their daily lives entailed. My mom and I spent a lot of time discussing what we knew about the people, but most often, we just had a name, and an idea of how we are related. That’s it. Sometimes we don’t even have a name, and nothing else to go on but what we can see in the photograph. 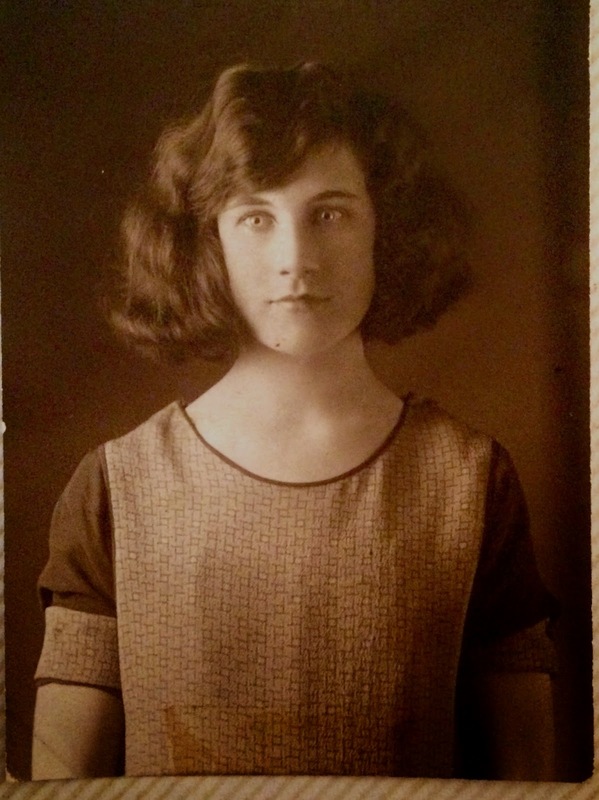 One of the photos that really interested us was this portrait of a female relative. It was probably taken in the early 1900s. We found her name, Mary, written next to the photograph. The first thing that caught our attention was her striking and intense gaze. I found myself envying her hair most of all, though. (It’s so perfectly controlled, how did she contain her curly hair? Did people use products on hair back then? I’d like to know what she used, I could use advice). Also, her posture is so perfect it almost hurts my back to look at her rigid pose. She looks beautiful and graceful, but also very alert. Honestly, she should probably put the caffeine down, and this is coming from someone who drank five cups of tea yesterday. With her observant and amazed expression, she seems almost bird-like. My uneducated guess is that she was just amazed of the photography taking place, and this wasn’t her natural expression or pose, ha. It’s such a gift to have this photograph, though. My mom decided to do a painting inspired by the photograph, which you can see at the top of this blog entry. It’s an oil painting, and it’s 9 by 12 inches. Mom opted for loose, thick paint strokes and a more relaxed and natural expression for Mary. I love the color scheme she picked to represent her. It’s tricky with black and white photos, so you have to be creative. The cold blues and teal in the background look great next to her porcelain skin, and strawberry blonde hair. The touches of purple in the background accentuate her violet eyes and magenta lips. Although she altered Mary’s expression, it still feels like the same woman to me. Mary looks beautiful, observant (but no longer amazed and bird-like), and has retained her elegant posture. And I still want her hair. Seriously, I need help with my hair. Happy Saturday! When the days are getting shorter, darker, and colder, It's a good time to be grateful for people in our community who help those in need. Whether they're helping to feed and care for other people, or animals, their essential role in our community is often taken for granted. This Sidetrack Saturday, I’d like to blog about something that is very important to both me and my mom. ‘Skye’s Spirit Wildlife Rehabilitation Center’ is our favorite local non-profit organization. Located in Harrisville, Pennsylvania, they are constantly rehabilitating injured, sick, and orphaned wildlife and birds. We follow them on facebook, and love reading updates on their important work. Their main webpage can be found here. Please feel free to click on to their website and read more about the skilled and dedicated care they provide to local wildlife in need. Their work is vital and often overlooked. They save the lives of hundreds of animals a year. I’m personally very glad that people so dedicated and caring are looking out for the wildlife and birds in our area. It takes a special loving spirit to run such a devoted organization, and I applaud their hard work. Right now, they are holding an online auction to benefit the sanctuary, which can be found on their facebook page. My mom contributed a painting to the auction, and there are some great items available from other talented craftsmen and artists. The items are very easy to bid on, simply with just a facebook comment. If you win an auction, items can be purchased easily through paypal. Their current online auction ends on November 30th. However, if you’d like to help in another way, here is a wishlist of items that they currently need. I can’t even imagine the amount of supplies their operation requires on a day to day basis, and I’m sure the costs add up quickly. Another great option is to pledge your support through a paypal donation. They need all of the help they can get, as they are not state or federally funded, and always have a full house of needy animals. I’d also like to suggest you consider simply following them on facebook. Their posts are always interesting, educational, and they often provide images with information about the animals currently in their care. I have included a picture of the painting my mom contributed to the auction to benefit Skye’s Spirit Wildlife Rehabilitation Center. 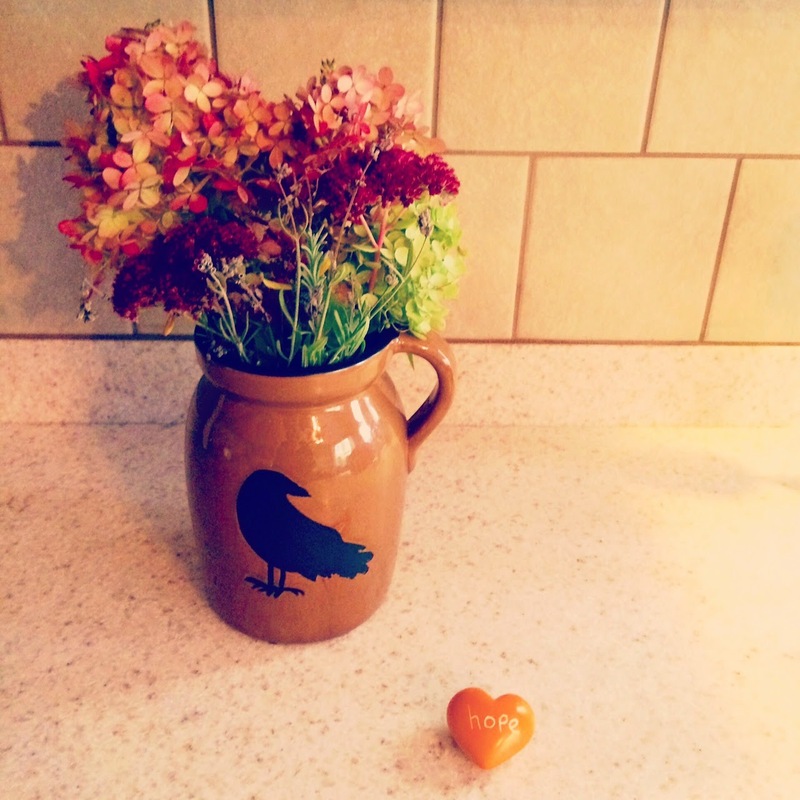 You might recognize the Raven vase we found over a month ago in the village of Valont PA. I mentioned it in a previous post. 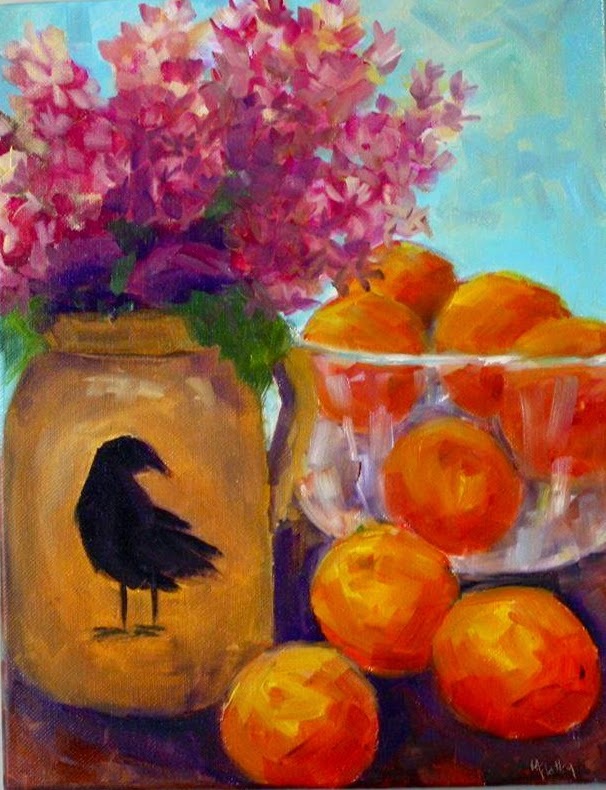 I love this painting, with the rich oranges and pink and purple flowers, and I’m glad to see it go to a great cause. Gratitude can be a powerful life changer. Even when it doesn't change your situation, it can completely alter your perspective. Take a moment to think about who you're grateful for, and you might be surprised by where that feeling takes you. Have a great evening everyone. This is one of my favorite muses. Old barns. They have character, color and a history to tell. I painted this from a photograph of a recent barn hunting trip off Old South Hill Road in Erie County, PA. Happy Halloween! It’s Throwback Thursday and we're going way back to the 1800s! Tonight I decided to write about Henry Wadsworth Longfellow. Longfellow was born in Portland, Maine in 1807. He quickly showed a passion for writing in his youth, even though his father wanted him to go into law. After college, Longfellow spent three years traveling throughout Europe. While he was traveling he was not idle, but mastered seven different languages and absorbed as much as he could about literature in the countries he visited. Throughout his life he traveled often. Longfellow eventually settled in Cambridge, Massachusetts, and taught Modern Languages at Harvard University. He became wildly successful and famous during his life, which is a rarity for poets. He was well loved, not only for his poetry, his passion for travel and linguistics, but also for his romantic personality. He died at 75 years old in Cambridge, Massachusetts. Being from New England, you can bet Longfellow wrote some good Autumn poems. Who else loves Halloween? No, no... I mean seriously loves Halloween. I do! It’s my favorite holiday. 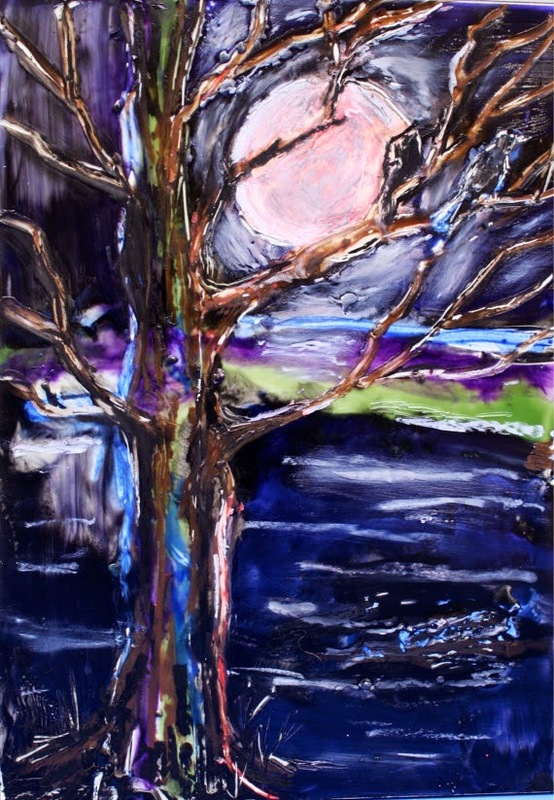 Because I am so excited for Halloween, I decided that I also wanted to write about this encaustic painting my mom did a while back. I think it’s a perfect painting to share so close to October 31st. I love the barren tree sitting in front of a bright full moon, just obscuring your view. The dark background with streaks of purple, silver, green, and blue, looks as if it’s dripping off of the board she painted it on. The texture of the encaustic wax certainly adds to the painting. Touching the wax, you can almost feel the chill of a misty night. Ooo, I think she should do more creepy paintings like this one! A great poem to share with this painting would be “Haunted Houses” by Henry Wadsworth Longfellow. Enjoy, and have a happy Halloween tomorrow! I’ll be back on Saturday. It’s modern Monday! We had a great time on vacation, but now it’s time to get blogging again! The internet has altered the way we share art in many astounding ways. Not just through digital images of artwork, files of music, and eBooks of novels, but also through videos of poetry. Yes, videos of poetry. Today’s modern Monday inspiration comes from the spoken word poet Sarah Kay. I adore spoken word poetry, and Sarah Kay is particularly amazing. However, I also love the work of Omar Holmon, Jeanann Verlee, Amy Miner, Lauren Zuniga, Kait Rokowski, Haley Mosley, Taylor Mali and Sierra DeMulder. I have spent a lot of time, particularly when battling bouts of insomnia, consuming the work of these wonderful spoken word poets. Today I am sharing with you a short video taken from Sarah Kay’s TED talk in 2011. If the video doesn't appear for you, you can click here. In this short video, she recites her poem, Hiroshima. It is a beautiful poem. If you’d like to view her entire 18 minute TED Talk, which is fantastic, please click here. Spoken word poetry is fascinating because it takes the intimate and solitary nature of reading and writing poems and transforms it into a social event where the poets exchange perspectives and viewpoints with others. Let’s face it, poets are not typically social people. There are many reasons for this, ranging from a tendency towards simple introversion, to the common fear of judgment on the contents of their poetry. It takes brave people to stand up on a stage and speak their poetry, their life, their words. It takes courage to display all of the contents of their mind and soul and open it up to commentary. I applaud them for it, particularly when they do it as beautifully as Sarah Kay does. Also, another hard fact to swallow: There are many people who would never think to pick up a book of poetry. Unfortunately, poems sometimes are left stuck on the page, inside a closed book. They are often left unread, or in the least, merely skimmed. (Why do I feel like I'm writing for a tear-jerker donation commercial right now? Donate now to help these poor poems be read as they were meant to be read! Anyway, the point is...). To hear a poem spoken dramatically out loud, by the poet in his/her own individual voice, is a fantastic experience. In spoken word, you will always get a unique perspective, on a unique subject matter, by a unique poet, in his or her unique voice. To me, it doesn’t get much better than that. I'll be back on Thursday! It’s Modern Monday! Today we’re going to talk a bit about the artistic and intelligent set design on one of our favorite TV shows. The creators of BBC’s Sherlock took the stories written by Sir Arthur Conan Doyle from 1886-1927 and seamlessly set them into our modern world. Arthur Conan Doyle wrote a total of 56 short stories and 4 novels about the enigmatic detective Sherlock Holmes and his loyal friend Dr. Watson. The show creatively modernized the stories of Sherlock Holmes in a unique and clever manner. While certain aspects have been altered, such as adding new characters, and changing plot lines slightly, the general themes are intact. Sherlock Holmes is still a brilliant and strange detective with very little social grace and Doctor John Watson still acts as his dedicated and brave best friend. The show has had 3 seasons so far, each consisting of 3 ninety minute episodes. Filming on a special 90 minute episode will begin in January of 2015, and then they will begin filming a new season of 3 more 90 minute episodes in early 2016. Meanwhile, fans of Sherlock will have to 221B Patient again. I have a feeling it will be well worth the wait. My favorite aspect of the show is how detailed and nuanced it is. The set design for Sherlock’s apartment at 221B Baker Street is a prime example of their attention to detail. The entire apartment is full of symbolism. While watching, I am often easily distracted by the unique items they have decided to show us. Nothing you see on the show is accidental, and many items carry extra meaning. To point out just one instance, let’s look at the two chairs in the living room. 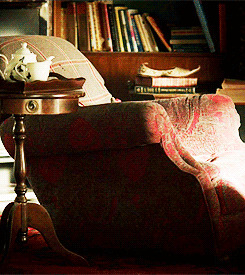 I’ll describe John’s chair first, and then compare it with Sherlock’s chair. They have been carefully chosen for artistic and symbolic reasons. 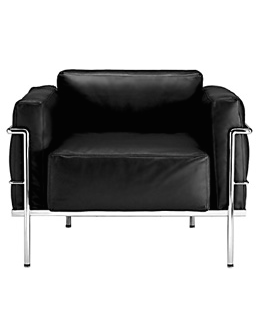 John’s chair is comfortable and inviting, with a traditional design. It’s a warm red color and is often shown with a union flag pillow and/or a plaid blanket. If you were to pick a chair for a patriotic, kind, well mannered man who is almost always wearing warm comfortable sweaters, this would be the chair. On the other hand, Sherlock's chair has a sleek design of black leather and cold metal. It is modern and stylish, but certainly not inviting or warm. It looks uncomfortable and cold, or at the very least, like an acquired taste. It has never been shown with an added pillow or blanket for comfort. This fits perfectly with his character. Sherlock is almost always seen wearing modern, uncomfortable clothing (particularly black suits), and he has a cold and calculated demeanor. His mind is sharp, and his attitude is as well. Artistically and symbolically, this chair makes sense for his character. One of the many unique items seen in the apartment on Baker Street is a white teapot adorned with a map of the United Kingdom and Ireland. I did a bit of research and found it is handcrafted and was designed by the British artist Ali Miller. It can be purchased directly from her website here. It’s gorgeous, and fits the show perfectly. In fact, it can be seen situated next to John’s chair in the image above. This teapot has become an iconic symbol for fans of the show. Mom and I are preparing for a trip to New England next week to see family and to catch a glimpse of the famously beautiful Autumn landscape. As a result of this, Sidetrack Saturday will have an Autumn theme tonight. Last week on Daily Paintworks (an art website that my mother belongs to), they challenged their group of painters to create Autumn scenes. They have different challenges weekly on Daily Paintworks, and It’s always fun to see what each of the talented artists decide to make. They are all inevitably unique and interesting. My mother contributed this painting to the challenge. 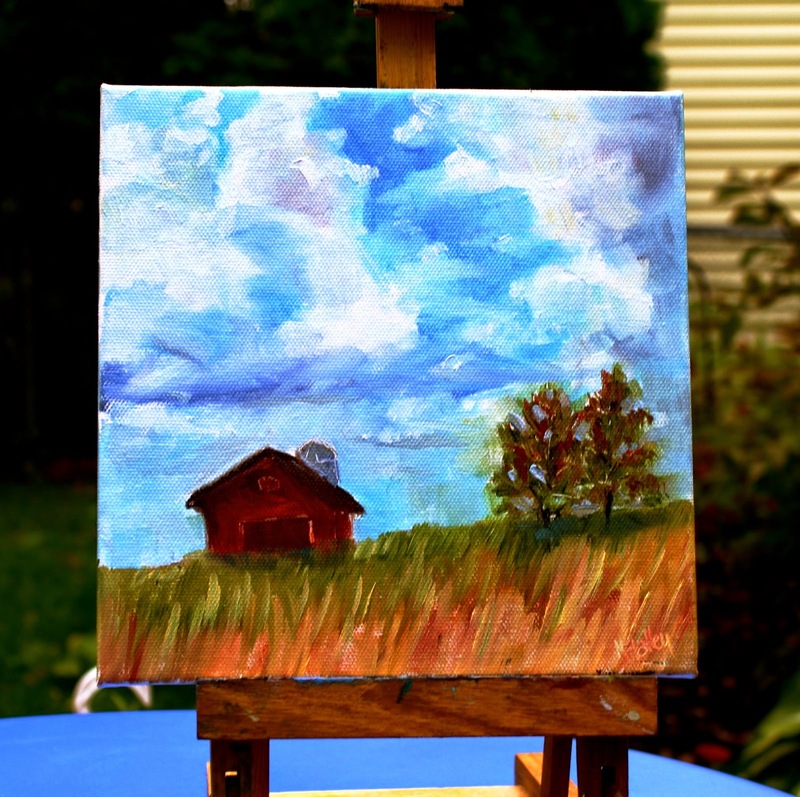 This is an oil painting of an Autumn scene on a 6 by 6 inch gallery wrapped canvas that she whipped up in one sitting. It's based off of a photograph that we took while driving about the countryside recently. I enjoy the moody clouds, which are so characteristic of Autumn. I also like the wind swept trees. It has been very windy lately, and so a lot of our trees are already missing a good amount of their leaves. I'd imagine that is a difficult thing to convey in a painting. I’ve never been a painter, but I can understand that within all creative fields, such as painting, drawing, or writing poetry, it’s important to practice doing work quickly, on a whim, and while using varied styles and subjects. This is why my mother appreciates the weekly challenges from Daily Paintworks. It keeps her well practiced and her styles and themes varied. For a similar reason, It’s also why I enjoy my workbook for writers, titled “642 things to write about.” I love that book, because it gives the writer creative prompts to write about subjects that he or she might not normally write about. I've often been perplexed by their prompts, such as "Write a love letter to a person you strongly dislike" and "How would your life have changed if you had married your first crush?" And yes, that is how it should be formatted. If you’re not used to his style, an E. E. Cummings poem could seem confusing. Don’t panic! If you look closely, you will see that there are only four words within the poem. If you turn it horizontally, it is easier to read (although this lessens the impact of the poem). Now it is easy to pick out the four words: Loneliness, a, leaf, falls. However, you can see why it is important for the poem to be displayed vertically. As you read the letters, your eyes follow the pattern of a leaf seeming to fall down the page. It’s also important to note the feeling of solitude within this short poem. Obviously the presence of the word “loneliness” would make you assume that, but it goes deeper. The lowercase l in loneliness is separated from the rest of the word, which means it looks rather like a number 1. Indeed, one letter being separated from the rest of the word adds to the feeling of loneliness and everyone knows that 1 is the loneliest number. In addition, I’d like to mention that the rest of the separated word spells “oneliness.” Even though that’s not technically a word, it was a cool choice! Cummings was known for making up words, and you can interpret ‘oneliness’ to mean anything you’d like. However, to me, it denotes ‘being one’ or solitary. While watching Autumn leaves fall, people are naturally reminded of the solitude that occurs in the coming winter, and of our own mortality. The symbolism of the seasons was very important to Cummings in particular. He wrote many amazing poems praising Spring as a beautiful, magical rebirth. Therefore, he saw Autumn as the opposite to the life of Spring. He is hardly alone in seeing the coming winter as a solemn event. Anyone who lives in the north inevitably finds themselves living their life very in tune with the cycle of the seasons. As we plan our trip for next week, the coming winter is on our mind, too. This will probably be our last road trip before the snow takes over our lives for months. I’m not being melodramatic, Erie gets a hell of a lot of snow. We’re going to enjoy the pleasant weather while we can. Frida Kahlo's "Self Portrait with Necklace of Thorns"
It’s Throwback Thursday again, the one day a week we have selected to spend admiring the life and work of an inspirational artist who is no longer alive. Today we honor Frida Kahlo, the beloved Mexican painter who lived from 1907 until 1954. She was bold, happily strange, and vibrant. Where ever she went, Frida was known for her strong personality. People remember her for the way she eased swear words into casual conversation and told dirty jokes. She was very involved with the communist party, and she frequently smoked, drank too much tequila and sang vulgar songs. Basically, she belongs on everybody’s “10 people, living or dead, that I’d like to invite to a cocktail party” list. Frida lived a very dramatic life that was full of tragedy and despair, but her artwork remains well loved and her personality still shines through her artwork today. She left an enormous legacy, and her 151 paintings sell for more money than any other female's artwork. Frida survived polio as a young child, and was called “Peg Leg Frida” by her more obnoxious classmates. Despite this, she was brilliant and performed well in school. By age 16, she was reading and writing in Spanish, English and German. It’s important to remember that this was in the 1920s, and many women were discouraged from having a formal education. Frida’s own mother did not approve of her spending so much time on school, but her father often praised her intelligence, and encouraged her studies. She never planned on becoming a painter. Her father was a jeweler and an amateur hobby artist, but she wanted to be a doctor. Frida was signed up for medical school at 18 when fate stepped in with a different plan. One September day, the bus she was riding in collided with a trolley car and her life was altered forever. Frida sustained such tremendous injuries that her doctors did not think she would survive. Frida was often bedridden, not only during her initial recovery, but throughout her life when she had to withstand some 30 surgeries. While she was initially confined to her bed, her father let her borrow his painting supplies. 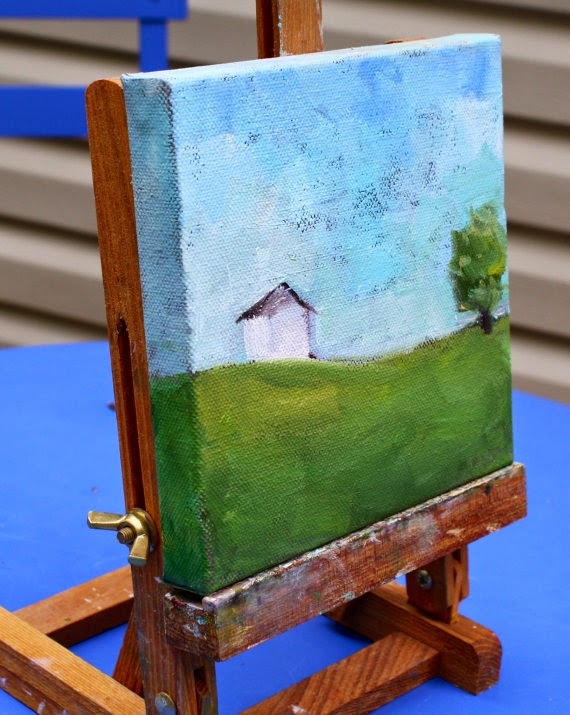 Her mother had a carpenter install an easel that could lay on her bed. They even set up a large mirror by her bedside, so that she could paint her reflection. Frida found solace in her artwork. She expressed not only her physical pain, but her emotional pain with her paintings. Throughout her turbulent marriage, divorce, and remarriage to famous muralist Diego Rivera, she used painting as a means of sharing the story of her life. If you know how to read them, her paintings tell very dramatic stories. 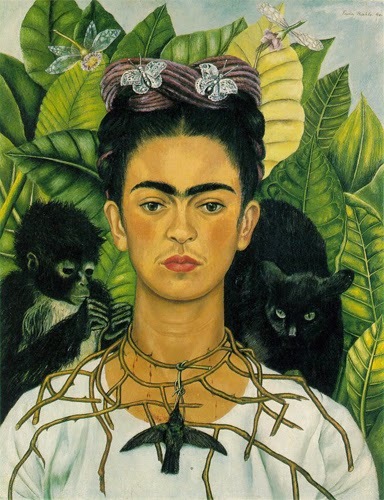 Frida created expressive, emotional, and honest art. 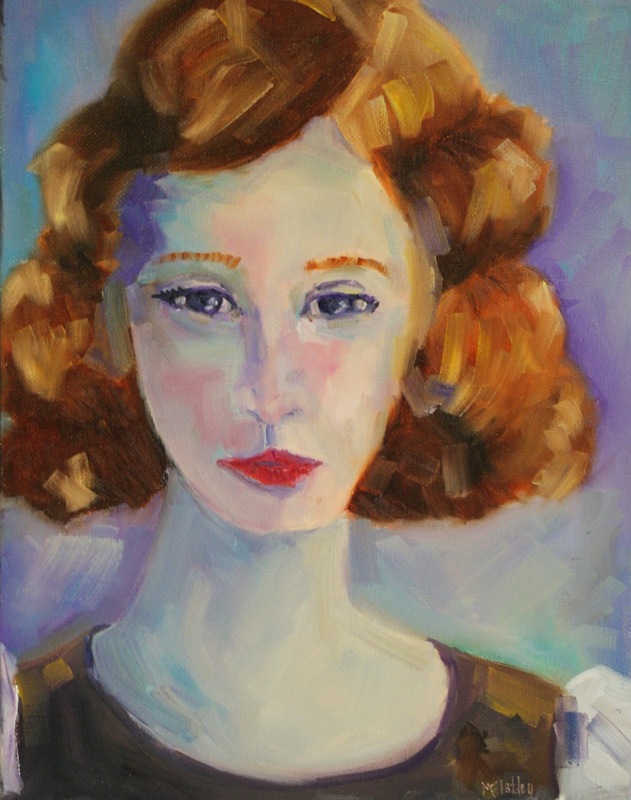 Most of her paintings are self portraits. She unflinchingly and fearlessly portrayed herself for who she was. Her paintings include sorrow, infidelity, surgeries, romantic rejection, and hospitalizations. Frida was not one to sugarcoat. She was self expressive, with complete honesty. Some called her Surrealist, but she said she did not paint dreams, she painted her reality. Frida survived many severe traumas. However, she made the most out of the sharp turns of her fate. She considered them a part of the process of life itself. Frida once wrote in her diary, “My painting carries with it the message of pain” but she also wrote, “Pain, pleasure and death are no more than a process for existence. The revolutionary struggle in this process is a doorway open to intelligence." I believe that Frida was right. Many people live their lives trying to hide from pain or unexpected trauma, and while that is understandable, it is impossible. Pain will come to you, eventually, no matter how you live. It is within those struggles that you show your strength, your true personality, and your resilience. I have noticed that people who have endured trauma tend to be wiser, more self expressive, and kinder individuals. Pain left them this parting gift. It is the one consolation they are given. Join us later in the week for Sidetrack Saturday. I'm afraid this entry is being posted rather late, as lately I've been getting lost in the hectic details of every day life. However, I have been wanting to write up a post about this painting that my mother did. It’s a nice countryside scene. It features a simple white barn on the left, situated atop a rolling hill with a pleasant tree on the right. The shapes are largely geometric, the strokes blocky, and the colors used are not complex. I loved the look and feel, but it’s not my mother’s usual style. I was intrigued, so I asked her what style of painting she was inspired by. She told me that while she wasn't trying for a particular style, she did use style elements from Minimalism. I was an art history major for my first year of college at Indiana University of Pennsylvania, and as a byproduct of this, I still enjoy researching different styles of art. I’m particularly interested in how different movements are created by the politics and social environment of the time, and then are reflected in all areas of art and culture. Minimalism did not just include painting, but also interior design, music, sculpture, fashion, and writing. The Minimalist movement gained particular popularity in the 1960s, and when most people hear the word today they think of the iconic modern interior design and fashion that resulted from the movement. Indeed, remnants of the style still remain popular today. Minimalism, in general, focuses on clean lines and geometric shapes, with simple color and design. It makes sense that this would be well liked for interior design and clothing in particular. Simple shapes, colors and design elements look pleasing to the eye. They typically don’t jump out at you, distract you, or clutter the space that they are in. It is nice to have a bit of zen. A cluttered room encourages a hectic life. At any given moment in our times we are amidst constant distraction. The television news spews stress, text messages beep from your phone and your iPad dings with facebook notifications. A bit of minimalism can be very welcome in our modern times. Why add an excess of design details to everything around you? Your handbag, jewelry, clothes, the painting in your bathroom, and the couch in your living room--- they can all be simplified. There is a certain beauty and sense of relaxation in a simple design. Some minimalist paintings are incredibly simple. One color, one shape, maybe a line or two. Some are a bit more detailed, such as my mother’s painting here, but the general feel is the same: more simplicity, less unwanted clutter. Very true, Thoreau. I can't help but think of how horrified he would be to take a peak at life in 2014. In many ways, we have lost our roots. It’s important to take time, and to remember them. Every month or so, I get a bad case of wanderlust. The only proper thing to do in this situation is an impromptu day trip, particularly if the weather is crisp and cool like today. Autumn days before the cold completely takes over are precious. I feel the need to savor the energetic air. It revitalizes me. Today we gave in and decided on a long drive, with only vague plans (those are the best kind of plans!). After a brief discussion, we left the house with our cameras, the location of my Nana’s childhood home, and the address of Volant Village. After an hour and a half drive, we had lunch at Donna's Diner in Sharon, Pennsylvania. They make a mean veggie burger, tasty fries, and were very helpful with working around my brother’s gluten free diet. We took a peak at my nana’s childhood home, and then drove along winding roads lined with farmland and falling leaves to reach Volant Village. After 15 minutes of sharing the road with horse-drawn carriages, we arrived. Volant Village is a sweet little town. Quaint, charming, and perfectly decorated at every step. There are many specialty shops throughout this picturesque town, but a few were particularly memorable. Volant Mills is a large historic building (est. 1812) in the center of the village. It is currently being renovated. 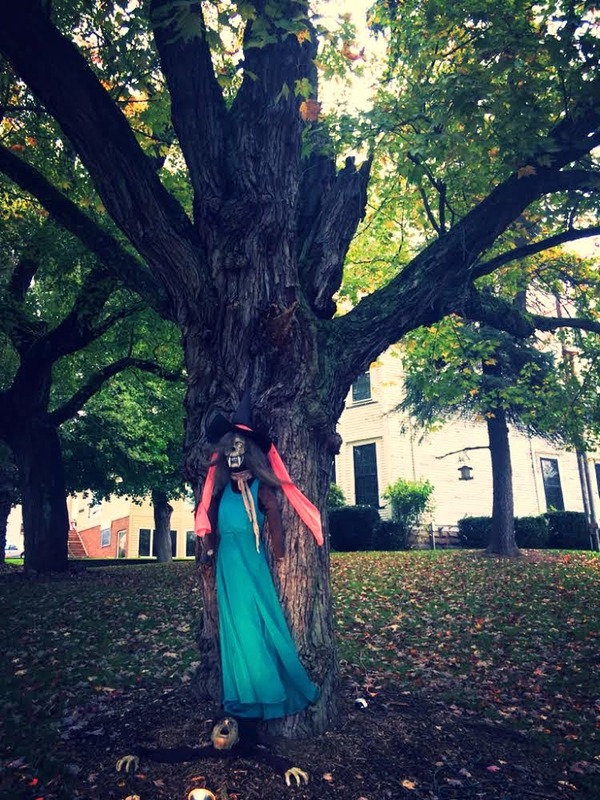 The yards around this entire town were decorated for Halloween, but ‘Volant Mills’ had perfectly handcrafted wood furniture, and many fake witches in amusing positions. Witches were perched on rooftops, smacked into windows, stuck under buildings, and standing by large, creepy trees. My camera hardly left my hand. 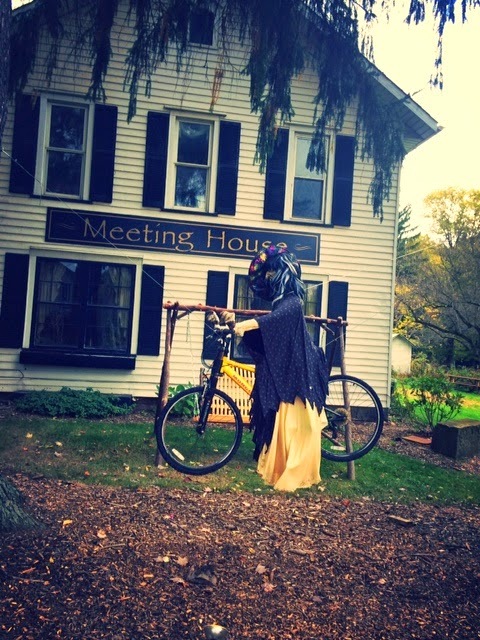 Most notably, I was particularly amused by a witch suspended in the air, flying a bicycle in front of their meeting house. We also bought a decoration for our front door. The helpful woman in the shop informed us how to easily remove the current Autumn embellishment and install a new one (holly, flowers, etc.) to keep it current as the seasons change. I found that quite nifty. My brother was just pleased that he was offered a free piece of Halloween candy. It was a relaxing day of exploring new places, enjoying great food, celebrating nature, and meeting friendly people. A perfect Autumn day. If you ever get a bit of wanderlust, I recommend a day trip into a small country town. Ensure that your plans remain vague, make sure you bring your camera for the natural beauty, and remember: small towns can pleasantly surprise you. On October 5th, just three days from today, a statue of Edgar Allan Poe will be unveiled in downtown Boston. It is to be installed in Poe Square, at the intersection of Boylston Street and Charles Street South. The sculpture was designed by Stefanie Rocknak and it is gorgeous. It has been titled "Poe Returning to Boston" and it is situated where Poe would have walked in order to get to his birth home. I am excited, which is why I picked Edgar Allan Poe for our throwback thursday artist this week. Throwback thursday is a phrase that kids these days (get off my lawn!) use when sharing a picture of themselves that is no longer current. My mom and I have decided that for this blog, throwback thursday will be the day of the week when we post about an artist (be him/her a painter, poet, novelist, photographer, musician, lyricist, balloon animal technician, belly dancer, or sandwich artist) who continues to inspire us, despite no longer being alive. We are constantly being inspired by a wide range of artists, because “ART” is vast. Those three letters pack a big punch. Edgar Allan Poe was most definitely an artist. The first time I learned about Poe was shortly before Halloween in 5th grade. I remember it well because the way he was presented left me completely fascinated. My teacher had announced that we were going to have a special Halloween celebration that required parental approval. (Oooh!). She warned it might be scary, and reminded us that we could leave the room at any time and sit down in the hallway. (This was starting to sound cool). She pointed out the three slacker students who had not turned in a parent's signature of approval, and said that they would have to leave the room. (Yes! Ha!). She then escorted them into the hallway with books to read for the next twenty minutes. This was already quite thrilling. My brilliant teacher then turned out the lights, returned to her desk and pressed play on a cassette player. What followed was a dramatic reading of "The Raven" and "The Tell Tale Heart" by Edgar Allan Poe. Needless to say, I was enthralled, especially by "The Tell Tale Heart." It's not every day in 5th grade, that you get to sit in the dark and hear a murderer calmly discuss why and how he killed an innocent man. The readings were dark, fascinating, and beautifully spoken. If you have only read Poe's work silently to yourself, I am sorry to say, you have never fully experienced Poe. The difference in hearing the rhythm to his poems and short stories is essential to comprehending their full beauty. If you are interested, I'd recommend doing a youtube search to listen to some of his poems and tales. There are some great readings on youtube voiced by Vincent Price, Christopher Walken, and James Earl Jones in particular. Of course, Poe did not only write sad poems and horror stories. He also wrote great detective stories, and even comedy. Many have acknowledged Poe as being the first to pen 'the modern detective story'. Even Arthur Conan Doyle, the writer of the Sherlock Holmes stories, admitted that Poe was a huge inspiration to him. To this day, Edgar Allan Poe continues to inspire artists in many ways. Not only is Boston getting a beautiful statue, but it seems that almost every day I notice something new: I am currently wanting this hilarious sweater, I recently purchased a beautiful set of Raven bookends at 'Fireside Book Shop' in Chagrin Falls, Ohio, and I have been known to drink Black Raven Tea by Baltimore Coffee and Tea Company. Of course, my mother has not been immune to his influence. About a year ago, when Poe came up in conversation between us, she admitted to knowing very little about the details of his life. I regret that I reacted a bit obnoxiously by spending the next few hours emailing her informative articles. Sorry Mum, I couldn't help it. He certainly led a fascinating life, but it's interesting to note that his reputation as a 'moody gothic drunk' might not necessarily be accurate. It seems a lot of rumors surround his personality and manners, but one thing is certain: His writing remains relevant and inspirational to many. 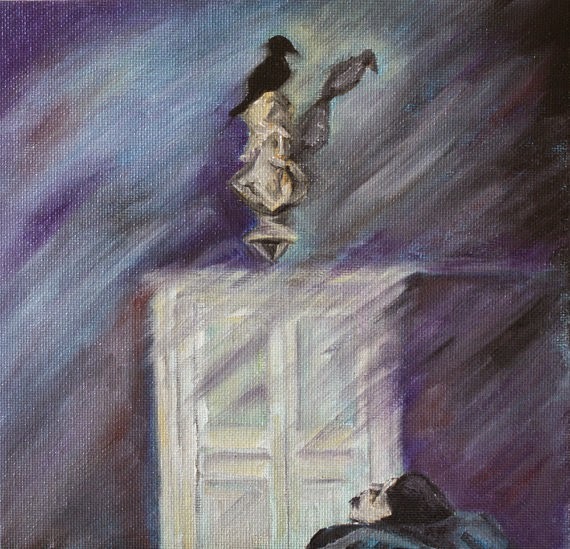 After I hounded my mother with details about Poe, I was pleased to see that she had made a beautiful oil painting depicting a scene from The Raven. At least, I'd like to think that the inspiration for this painting came from The Raven, and not from the great despair I caused her with my endless tedious articles. I'd like to know, is there any topic that you can't help obnoxiously 'educating' people on, even when you know it might be considered rude? I usually know when to remain quiet and respectful. However, when it comes to something I am truly passionate about, my politeness vanishes. Thanks for reading, I'll be back in a few days for Sidetrack Saturday. In the meantime, my mom and I have been working on setting up her new page on Seller Group, which is an exciting new site with some great artists, and I just noticed that she forwarded me a link entitled "10 British Actors Reading 10 British Poems" that I am about to investigate! The first of any month is a great time for new beginnings. I woke up this morning with “rabbit rabbit rabbit” on my lips, and I am prepared to make October of 2014 a productive one. Not at all like October of 1997 -- That one was such a colossal waste; I hardly got anything done. To be fair to myself, though, I was only ten years old at the time, and any ten year old really ought to get away with as much laziness as possible. Unfortunately, I am no longer ten, and the laziness of my childhood must end at some point. Those of you who follow my mother’s painting posts may be surprised to note a sudden change in writer. Perhaps I should introduce myself. It would be a great step towards a decidedly un-lazy October. My name is Caitlin, and I’m Maggie’s daughter. My mother asked me to become a regular contributor to this blog and I am excited to begin, not only because it will help my productivity, but also because I love to write. I grew up watching my mother paint in any free moment she had. She never shirked on her duties as a mother, but simply awaited a free moment to make art. I remember coming home from school, and tossing my backpack on the dining room table next to her most recent oil painting. I grew up in awe of her art, watching her paint with careful study, and gradually, I learned to appreciate all forms of art. I consider myself lucky to have had such an inspiring teacher. Art can be so many things, but everyone tends to favor a certain direction. One area is never better than the other. Nevertheless, people will have their preferences. Let me explain. Some may have a passion for oil painting, others for pen and ink drawings, filmography, the violin, even dancing (Nutters. Kidding!). Although I do enjoy and appreciate many forms of art, I have always favored the art of the written word. I have an unhealthy preoccupation with poetry, plays, novels, and short stories in particular, but I’ve also been known to make and keep neurotic lists such as “Yes words” and “No words” (Some words are just GOOD and some words are just TERRIBLE, everyone knows this, but no one ever really discusses it. But I digress...). I think we can all agree that I can blame my mother for this preoccupation. Not only did she inspire me by consistently exposing me to art through her paintings, but when I showed an interest at a young age, in both reading and writing, she never failed to encourage me. When I was a child, we had countless trips to the book store. It was always exciting to me that she nurtured my love of books. Some kids might get a real kick out of gifts of a new pair of jeans, stuffed animals, a necklace, or concert tickets, but nothing felt as special to me as our trips to the book store. I’m afraid there is one more damning piece of evidence against her. I started writing in my first diary when I was nine years old. It is a beautiful forest green hard cover book, and in my first entry I explained that this journal had been a birthday gift from my mother. I won’t mention the other silly things I wrote about in that book, but the point is, she started it. :) Although I make jokes of pointing the blame, I am so very lucky. I realize that my love of the written word takes on an obsessive nature at times, but it is a big part of who I am today. As I know that most of the people who follow this blog are art lovers like my mother and myself, I would like to ask, who encouraged your love of art? How did they foster this special interest? Do you sometimes wonder what type of person you would be today, if they hadn’t encouraged you? Is there a child in your life that you like to encourage to appreciate art? What are your hopes for where their appreciation of art will take them? I would love to hear some great responses! (Hopefully, you do know by now that I love a good read.. heh). I am planning on contributing to this blog regularly, perhaps a few times a week. I have ideas kicking about my brain for posts not only on my mother’s art, which will obviously still be a focus, but other areas as well. I will be implementing a “Modern Monday” entry, which will focus on modern artists and writers who inspire both of us. Another addition will be a “Throwback Thursday”, which will focus on an artist or writer who is no longer living but still inspires us. Lastly, I am planning on a “Sidetrack Saturday” -- and that will be the real wild card, you never know what peculiar nonsense I might write about on a Saturday. Please do continue to keep checking in weekly to get updates not only on my mother’s art, but also my entirely productive, not at all lazy October. The Daily Paintworks weekly challenge was to do a rock painting. I went out in search of some rocks to photograph for ideas and found a lot of distractions. The lake is a good place to find distractions within nature. These rocks were found by the shore at the Perry Monument on Lake Erie. My daughter and I took another photo adventure this past Monday. This time we went off the beaten path on Presque Isle to the area of houseboats and a lighthouse. While taking pictures of the lighthouse and the gazillions of seagulls waiting for their fish dinner, this guy was in the middle of the buffet line. He or she had a companion join a few minutes later. They entertained us with their beauty, wobble walking and flying. We got back to the car and here he was keeping a close eye on a nearby fisherman. In the past, I lived in Florida and we would frequently see these majestic creatures. I'm not sure what he is, a juvenile Blue Heron, or a Sandhill Crane. I wish I knew. In some of the photos he looked blue/grey. In the photo I painted this portrait from, he was facing the sunset and took on a brown/orange hue. Painted in oil on an 8x10 flat canvas panel. The last weekend of summer is almost over. A gorgeous weekend. A lonely rowboat sits by the bay......the wind is blustery tonight, announcing the arrival of Fall. Painted in oil on an 8x10x1 1/2 inch gallery wrap canvas. There is nothing like a beautiful day in September. It helps if you have some time off when these days roll around. My daughter and I went on an exploration photography adventure this week. We found so much beauty on South Hill Road. The quiet. The landscape. I hope I did this justice. Painted in oil on a 16x20x1 1/2 inch gallery wrapped canvas. What a beautiful month. I found one of my favorite photos of a barn beyond a field. I took this photo in the waning days of August, 2012. Riding around with my sister in law, just looking for places to photograph around Millcreek Township near Erie, PA. 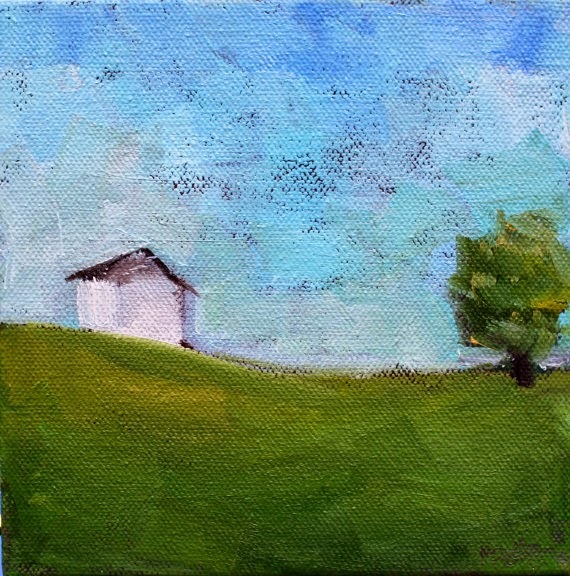 I did a small painting of the barn a couple years ago. This one is 16x20x1 1/2 inches. Painted in a rectangle style, it gives a slight abstract feel to the piece. All the brushwork is rectangles. The challenge to paint storm clouds. This week was a winner. The change of seasons here is very dramatic, windy and serious. Wondering how my blue hydrangea bush is doing. Left behind in my recent move, it's the only thing I miss about the old place. I planted a white hydrangea at the new homestead, it is lovely. But, I miss the cerulean, cobalt and lavender shades of the old bush. Hydrangea gets my vote for the drama queen of the flower kingdom. Geraniums that I received as a gift earlier this year. I brought them inside one day because the evening temperature was not going to be pleasant. The morning sun coming through the window the next morning made them dance. Painted in oil on an 8x8 inch canvas with 1/2 inch sides painted in turquoise. This weeks DailyPaintWorks challenge is to paint a tree remembering to leave the sky holes. I used the picture they gave and tried to convey the end of summer look to the landscape. I live by the Great Lakes and things are starting to look different. Color is just starting to appear on a few trees, the sky seems a darker blue and the air is not so humid. Painted in oil on an 8x10 inch flat canvas panel. Encaustic mixed media painted on a 5x7 inch encaustic board. Painted for the intimate landscape challenge. Right off my deck in the backyard. A new hydrangea bush planted this spring for a beloved companion who left this world after a 14 year stay in my heart. My turtle sprinkler has been in my garden for many years, brings back many memories. This painting is in oil on a 6x6 by 3/8 hard canvas board. Experimentation days. I have been playing with encaustic medium this past week. It looked like a lot of fun, messy, and dangerous. I managed one slight burn. I ordered a starter kit, got a temperature controlled fry pan and a heat gun. Lots of mess and noise. After the prime layer of wax cooled, I used oil pastel sticks to paint the lavender, fused it with the heat gun. Watching the color melt into the painting was magical. After the final layer of wax cooled, buff with a soft cloth and it shines. Carving in the wax was to much fun. Endless possibilities. Next stop, mixed media collage. Painted in encaustic with oil pastel sticks on a 5x7 inch encaustic panel. Another gorgeous house in Lilydale, NY. The colors are true. Purple, green, red and blue gray with the house next door a vibrant yellow. Every single home was unique in character and the flowers were amazing. Seriously thinking about another visit in the fall, the village is magical. This is painted in oil on a 9x12 flat canvas panel. The Heather challenge from DailyPaintWorks. A couple months ago, my daughter and I went on a day trip to a small town, not far from where I live. Lilydale, NY. It is a very quaint, sleepy town, in the summertime it becomes a very popular venue. Only certified mediums can live in this community. In the summer the village is gated, but you can still walk around and take in the beauty. My daughter and I visited Lilydale before the season started, it was so peaceful. Leo Tolstoy said, "Everyone thinks of changing the world, but no one thinks of changing himself." I decided to switch it up a little on this painting. Working on a larger canvas, I grabbed the largest brush I owned. I also did very little planning and just let it go. 16x20 inch flat canvas panel, painted in oil. I saw these on the vines at a friends house the other day. They were sitting in a bowl on the counter and the sun was streaming through the window, I had to photograph. I don't eat tomatoes, the closest I get to them is Prego and Heinz, but I love painting them, it is a challenge getting the translucent look the sunshine gives them. Painted in oil on a 16x20x3/4 inch canvas. This song by the Beatles, has always been a favorite of mine. My son sent me a photograph of the sky above Burlington, MA last week. Around the same time they had a tornado in Revere, MA. I used his photo and the lyrics written by Paul McCartney as the inspiration for this painting. I ran across an anonymous quote the other day. "A wish changes nothing a decision changes everything." 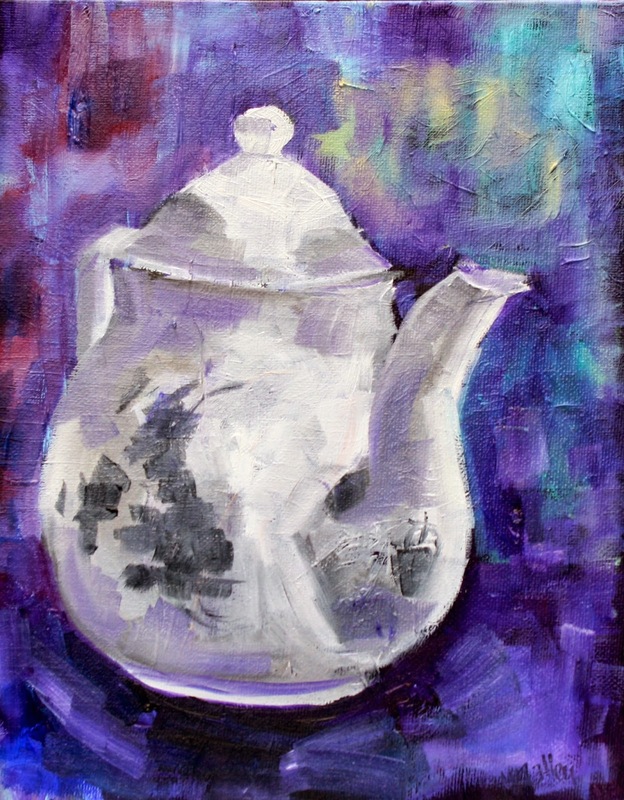 This painting, Lavender and Lemons was painted on a 12x16 inch canvas panel, in oil. I hope it conveys the contrast in the colors as well as the contrast between lemons and sweet smelling lavender. They can coexist in a wonderful place. I bought my first lavender plant this year. After researching growing lavender on the Internet, I was dismayed by the climate best suited for this little lovely. Dry and sunny, I live near one of the Great Lakes, not so sunny and definitely not dry. Glad I gave it a try. It still survives, in spite of a wind storm that tried to disassemble and exterminate. Painted in oil on a 1/2 inch, 8x8 canvas board. My favorite painting this year. "The only difference between a good day and a bad day is your attitude." I read this very simple quote today from art-quotes. com. It was attributed to Dennis S. Brown. I would like to keep this in mind and remember how simple yet difficult this can be. The world seems a little crazier these days. I have the choice. Starting with silence, most "things" can be overlooked, not worth the negative energy spent. These tiger lilies have been a colorful surprise in the garden of my new home. Someone before me planted with care an array of natures art work. Loving every minute of it. Painted in oil on a 12x16 inch flat canvas panel with much enthusiasm. The last of my sunflower paintings. I took a lot of photos, the buds are now blooming, I wanted to save some for painting in January and February. I wish summer would never end...but here in the North East, summer never seems to last long enough for me. I received some lovely geraniums on Mothers Day.....love to paint them and deadhead them. They are hardy and can take the punishment of my neglect. This Geranium was painted on a 5x7 inch flat canvas panel in oil. I love playing with the various shades of blue. I painted these sunflowers in oil on an 8x10 canvas panel. I don't know why I love putting them in mason jars, I am a jar hoarder. Changes. Inevitable and sometimes welcome. 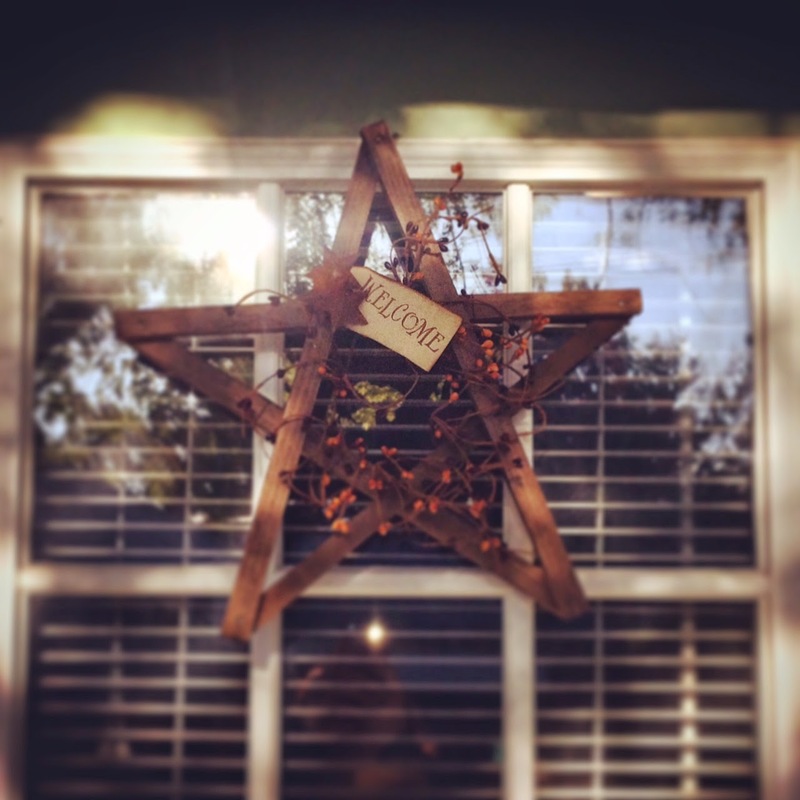 I've spent most of the past 18 months getting our home ready to sell. The process is daunting, clearing out pieces of your life you might not want to let go of, just yet. Thinking of what our family was like when we moved into this home. A lot of changes. The house sold and we moved the end of April. I love the new house, still getting everything set up and functional. I am taking my time.